Ekoplex is Ray Vincent, a multifaceted downtempo and psychedelic trance producer from Toronto, Canada. 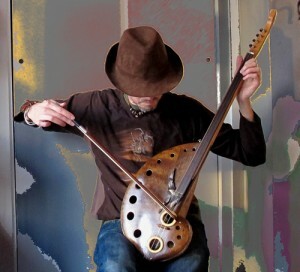 After making a name for himself with the massive success of Journey Of The TurtleJourney Of The Turtle (2008) and Creatures Of The Forest (2010), Ekoplex released Discovering The Ancient in 2012, charting a new direction into deep tribal psychedelic trance and downtempo with live instrumentation, guest vocalists, and experiments in alternate tuning. Recently he has been making his own string instrument, The Root, delving even deeper in music by integrating more live elements into his performances. Having played most of the major festivals across North America, he has also played in Costa Rica, Nepal, Berlin, Munich, Dortmund and the Czech Republic. Recently Ekoplex has joined forces with Sumashakti to create Thetaflo, a new project combining insights into the power of sound to create states of consciousness. Presently they are at work on a new album in the studio. Contact [email protected] for booking and licensing inquiries. An eclectic selection of delectable audio treats and sonic snacks for your ears. MP3 Download | FLAC Download | WAV Download · Download count: 20,775. An exploration of cosmic potential expressed through deep tribal trance and downtempo. An immense world-spanning psytrance compilation featuring music from 52 different artists from 45 nations. MP3 Download | FLAC Download | WAV Download · Download count: 44,111. Canadian and American psytrance and downtempo. MP3 Download | FLAC Download | WAV Download · Download count: 17,989. Full-on psychedelic morning trance from Canada. MP3 Download | FLAC Download | WAV Download · Download count: 36,151. A smidgen of full-on psytrance and a healthy serving of deep dubby downtempo and broken beats. MP3 Download | FLAC Download | WAV Download · Download count: 28,893. Journey Of The Turtle is the full-length debut from Ekoplex, one of Canada’s most well-respected psytrance producers. MP3 Download | FLAC Download | WAV Download · Download count: 56,097. Entheos Audio Archive 2.0 showcases the emerging psychedelic frequencies and vibrations emanating from Canada and the Pacific Northwest. MP3 Download | WAV Download · Download count: 25,283. The debut release from Ekoplex features three distinctly different visions of psychedelic trance. MP3 Download | FLAC Download | WAV Download · Download count: 22,301. What can I say about this album my friend!! AMAZING an absolute must download for sure!! Finally, the long awaited album! I’ve been looking forward to this one :D The cover looks awesome by the way and the tracks are fantastic!!!!! Keep up the good work! I have yet to listen to this, but am excited to listen to it. and for sharing this wonderful piece with us all to listen to and trip out to and splendor all the marvels of the Universe to!! thank you good Sir Basilisk for taking so much time to find such wonderfully awesome music for us punters to check out. and thank you to the fine artists like Ekoplex who share their beautiful creations. this is a fun release, and a good start for the netlabel venture. i look forward to hearing more in the future. Понравился! Автору пятёрку! Классный псай! Awesome release man.. love it! Thank you everyone for the kind comments. I hope you all enjoy the tracks. Big thanks to Basilisk. For all the promo and amazing art work. handled perfectly. Excellent sound – excellent work. Congrats on the first release, nice covers… nice mastering on this album. A great way to introduce yourself to Ekoplex’s work. ‘Turtle’ forms a nice progression from this. Greeets friend from up north! just droppin’ some love off at your website for you to have, nurture and share with others. btw is that a Julien SL tapestry in that pic ???? just wondering. Yep thats Julien’s painting. I think that was a party in montreal. Подскажите шооблончег под WordPress 2.6.2, чтобы был похож на ваш http://www.ektoplazm.com. More great music from Ekoplex. Thank you. I enjoyed Premonition so much I took the liberty of wrapping some psychedelic eye candy around it! EKOPLEX is hands down, the sickest psy I’ve ever heard. Damn you guys are good. Awsome work from ekoplex as allways and alexander did a graceful art work! I like track 02 most.